Every once in awhile, and for me almost never, a recipe comes along that’s so good you can close the book, put it some place safe, and never worry about finding a better version. It happened yesterday with this prize winning apple pie. I got the recipe from AJ at The Disney Food Blog, where she had the opportunity to interview the 2009 Crisco National Pie champ, Dawn Viola. If you’re a pie maker, you’ll love this. If you’re not, this pie might change that. The crust will make you a star. At first glance, Dawn’s recipe appears rather complicated for an apple pie. It’s not. It’s just packed with helpful details. As for ingredients, Dawn was going for the gold with her use of vanilla bean, vanilla powder and organic dry ingredients, but being that I’ve been home with a sick kid and unable to go anywhere, I used “normal” stuff (vanilla extract, non-organic dry ingredients) and still ended up with a great pie. One thing I didn’t change was the European style butter. According to Dawn, that plus the vinegar (acid) were key ingredients in the crust which is definitely the best I’ve ever made in my life. As for the filling, broiling the apples for 5 minutes (not cooking them through– just caramelizing the edges) gave the filling a nice depth of flavor. 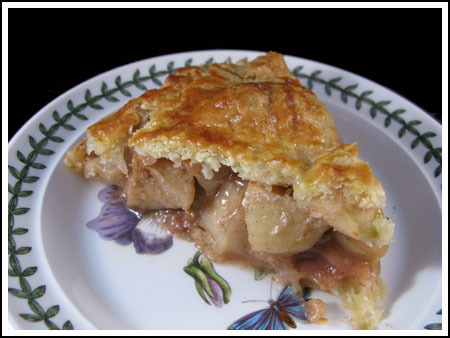 I loved this pie, and I tend to prefer lighter apple fillings with less-cooked apples and lemony. This one wasn’t light in any sense, but it was delicious. I’m not going to re-post the recipe because Dawn’s steps are so carefully written, but I do have a few notes based on my experience making the pie. — Substituting apple juice for the apple cider worked fine, I used a juice box! Seriously, ack. But worked. — If you have one, an apple peeler comes in handy. — there’s a step missing the original recipe. AJ is probably going to correct it soon, but the recipe doesn’t say what to do with the 4 tablespoons of butter in the fililng. What you do is slice the butter and arrange it over the top of the filling. — Makes sure you set the pie on a rimmed cookie sheet lined with foil. Mine leaked like crazy. You might not have that problem, but it’s good to be safe. Plus, you won’t have to use my super dangerous method of cleaning hot, smoking molten caramel out of the bottom of the oven. If you try the pie, let me know! In the meantime, I’m going to try the crust with some different fillings. HI ! making this for sure. I googled best apple pie recipe and yours came up. i’ve made so many, classic and ones with a twist, and i’m never satisfied. And i’ve yet to find a really good apple pie in a restaurant here in AUstin. Wish me luck!! She won the contest for the 2009 Crisco National Pie Champion. Why didn’t she use Crisco in the recipe? Thanks for commenting on this one because it reminded me I need to bump it up for the holidays. And yes, I did use vanilla extract in both. I know you posted this so long ago, but I have a question for you – did you substitute vanilla extract for the powder in the crust as well as the for vanilla bean in both the crust AND the filling? Hooray! Glad you liked it Deirdre. Like I keep saying, blind baking the crust can be an issue because the butter pools up, but the recipe works perfectly with fruit fillings. I need to make it again soon. Just had to make this pie for Thanksgiving!! I followed every step, except I did use the vanilla extract in the filling instead of the bean due to cost, and when I chilled the ingredients, I put all of the dried into a plastic yogurt container first , and then put the container in the freezer. Total of 4 hrs start to end. My husband and I agree this is the best–on par with Gianna’s . This year it was just the two of us for the Holiday, and the pie is GONE. This recipe goes is my book of those to make to impress!! Thank you so much for posting this !!! Thanks for the review! I loved this pie too. The only issue, and Dawn and I have both had this happen, is that the butter pools up a little when you try to blind bake it. It’s perfect for fruit pies and pies that don’t have to be blind baked. I read your blog daily and have made a lot of the recipes you post but I’ve never commented til now. I made this pie for the first time about a month and a half ago when we had tons of apples from apple picking. I have to say it was a little intimidating at first since I had never made my own crust but it was well worth the effort. I’m now making it for the third time for Thanksgiving and can’t wait for a piece tomorrow! I did have to tweak it a bit since I couldn’t find danish butter so I used regular butter and a bit of lard. My husband thinks it is the best apple pie he has ever had and he has had a lot cause he likes pie better than any other dessert. Thanks so much for bringing it to my attention! Happy Thanksgiving! It’s kind of hidden, I suppose. You have to click the link to Disney Food blog and head to the bottom of AJ’s post. Here’s the link in case you missed it. Where is the recipe? I read the description and I’d LOVE to try this pie. I tried to make this apple pie again . It turned out great! I used the proper amount of butter this time. Thanks for sharing this recipe! I made a variation of this pie using what I had on hand and it was excellent! Thank you for sharing it. I think this is the be all end all of apple pie, and can only imagine how great it would be following Dawn’s instructions to a “T”. I omitted the vanilla bean seeds completely and just used the extract (added after broiling), but I’m thinking Dawn did use both. She probably added the extract at the end since it would burn off under the broiler. You can email her and ask. There’s a link to her personal blog on my right sidebar. It’s called Wicket Good Dinner. I think there’s another error in the recipe…it says to add the vanilla bean seeds before broiling, but then says to add the “vanilla extract” after broiling, and vanilla extract is not in the filling ingredients list. I’m assuming I should not add any vanilla extract if I’m using the vanilla bean seeds? Lourdes, I think maybe you used too much butter. Dawn’s sticks were 4 oz! I’ll send you an email. Lourdes, I froze all the ingredients except for the butter. I figured very cold butter would work, and it did. I think Dawn does freeze hers, though. That’s interesting about the sticks, though. The European butter I use comes in 4 oz sticks just like regular butter. So I used 2 1/2 sticks which of course is 1 1/2 cups. If you used 2 1/2 8 oz sticks, you might have used double the butter. I’m going to email Dawn just to clarify. I automatically associate a stick with 4 oz, so it didn’t even occur to me that Danish butter might come in a larger stick. I’ve never made applie pie before, but I think this turned out okay. I used Lurpak danish butter. They come in 8 oz sticks, so I’m assuming this is the portion size of the butter that she used. I have the cuisinart classic food processor (from 1997) and I realized too late that this was too small to mix the dough in. I did my best to salvage it, but I think all of the ingredients were not incorporated properly. The dough luckily turned out fine , but not great. I will try to make this pie again, but will either buy a bigger food processor or make the dough in smaller batches. The recipe said to place all the ingredients in the freezer. I wasn’t sure if she also meant the butter , vanilla extract, and the vinegar. I placed them all in the freezer for about 20 minutes as instructed. What did you do ? I used only 1/4 cup of apple cider instead of the 1/2 cup. The filling was not wet at all. Just took this pie out of the oven! It’s GORGEOUS! And I snuck a little of the crust and some of the “goo” that exploded out of one side, and it’s YUMMY! Here’s another idea to help make a less runny filling–I used two tablespoons frozen apple juice concentrate in place of the 1/2 cup of apple cider. Seems to have worked well. For a little extra flavor, I also roasted the apples with a couple of tablespoons of maple sugar instead of regular granulated. MMMM! I was curious what you thought about using the crust recipe for other pies… like dividing it and making 2 pecan pies, or buttermilk pies (or even this crust for any meringue pie). Would it be the right sort of crust for that? I’ll bet if you reduce the apple cider, you won’t have so much liquid. I’ve made apple pies before and I don’t remember adding additional liquid to what the apples will make themselves. The pie crust will also hold up better with less liquid. Just my unsolicited two cents about this fabulous looking pie that I have not tried yet, but it’s on my list. Patrice, here’s the link. It’s kind of hard to see on some monitors, but the link was within the text. I’m new to this site, but dying to try this pie. Where do I find the recipe? I can’t seem to zero in on it. Thanks for all the comments and pix. I made the pie. It was great. Everyone loved it and I’ve had a request to make it for Thanksgiving! Hey, Anna! I made this pie this weekend also and made lots of substitutions: I used Kerrygold butter with just plain ol’ butter for the crust, no vanilla bean or vanilla powder and like Terri, I forgot the butter in the pie. While the crust only came out okay (I also forgot to put the pie on something so I thought I was going to have an oven fire with all of the butter dripping onto the oven floor), the filling was AMAZING…I am going to make apple pie filling like this from now on!! Thanks for the link!! Terri, there’s a step missing in the original recipe. It doesn’t say what to do with the 4 T. butter. You cut it up and put it over the filling. So yes, that might be why yours was liquidy. Then again, mine was liquidy too and I DID use the butter. Just make sure you set the pie on a rimmed cookie sheet to catch leakage. I made this yesterday and, while a little liquidy, it is a great pie! I did print the recipe from the blog and it calls for 4 Tbsp. butter in the filling, but I couldn’t find that in the directions, so I left it out (really, accidentally). Maybe that’s why my filling was kind of liquidy. I did like the big chunks of apples, though. Hope you’re feeling better, Anna! Oh my , this crust does look amazing!! I made this today. Very, very delish. I didn’t buy enough apples (3 short) and I forgot to compensate for that with the rest of the ingredients. The result was a super liquidy filling which I added a little cornstarch to (didn’t help). I left some of the liquid out when I poured it into the crust, but it still came out great. Also didn’t have european butter, but the crust was still yummy. Thanks for sharing. I just bought Danish butter and it’s one big 8oz piece of butter. Is the 2 1/2 sticks equivalent to 10 oz. of regular butter? I just got the recipe from AJ’s blog, which I also LOVE, and saw that I missed the pie championship on Food Network. Oh well, thanks to AJ and Anna for sharing this recipe! I just made this pie (my first ever! I’m usually more of a cookie girl) and it looks WONDERFUL! We haven’t tried it yet, but man, the filling was good even before it cooked. My Mom actually peaked at it after it came out of the oven, and thought it was store-bought. So excited! Randi, I used the butter sticks in the Deen brothers chocolate chip cookie recipe and they were great. But I think chocolate chip cookies are one of those things where margarines and butter blends can work very well if the recipe is writte right. I don’t think I’d try it with pie crust. You are daring. I always make an all butter crust. I made a crust with I can’t believe its not butter sticks( that I got for free) and it sucked!! I’m a butter snob I guess. 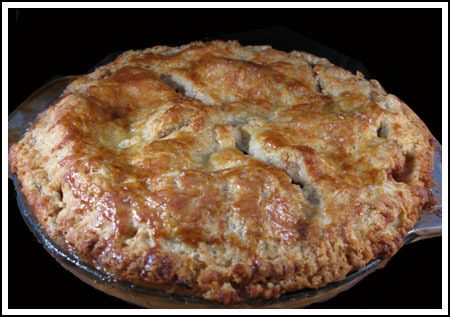 I’m going to make this apple pie for Canadian Thanksgiving( Oct 12th). Btw, if any of your readers want some coupons for the I can’t believe its not butter baking sticks, let me know. I have tons of 1.50 coupons!! Mmm! My go-to crust has vinegar (one of the keys) in it,too. But it also has an egg. The vanilla sounds interesting! Hey, if it won 1st place, it must be good! Looks great! I always make an apple pie ’round Thanksgiving. I’ll have to give this one a try as I never stick to the same one! Close the book, huh! Bummer about Fuzz! We just left our kids with my mom for a few days and she came back to be with them with a nasty cold! I have a feeling they’ll all take turns at it after she leaves! My apple peeler has a clamp to attach to a table or something. I rarely, how about never, use it as I have a couple of the Japanese peelers that work so well. It’s not worth the time to get out the apple peeler and clean it later. I, too, am going to try this pie. I read Dawn’s interview on the Disney blog, and she said she makes her own butter, but that the Danish is the closest commercially available. Cook’s Illustrated did a taste test on high-end butters and liked the Danish butter, Lurpak, the best. I wrote to Lurpak USA to find out where it’s sold, and if I remember correctly, Whole Foods carries it. I’d be very interested to know how Dawn makes her own. I have a local dairy that sells non-ultrapasturized 40% cream to the public, so I’d love to give it a try. Thanks, Anna, for trying this treat and letting the rest of us know about it! secret.I too will never try another toffee recipe again. IDoes anyone know if the Food Network is going to air that Crisco Pie contest? It really does look like the perfect apple pie with that lovely crust! I’m definitely saving this recipe and will give it a try. I’ve got apple pie on my “to-be-baked-with-all-the-apples-we-picked” list. 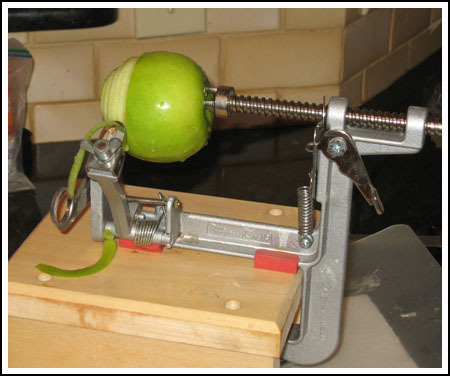 Wish I had had that handy apple peeler! I’m a sucker for a good Apple Pie! My mouth is watering just thinking about it. that is a good crust, no doubt. Lisa, I never mount mine. I just set it on the counter and hold it down while I’m spinning. Hula, thanks for the well wishes for Fuzz. We thought she was better last night, but today she’s running a fever and has been lying around crying because she’s so sick at her stomach. I feel bad for her, but am glad it’s not H1N1. She finally cried herself to sleep. Poor little thing. I’ll email you my super dangerous method. I don’t condone it. LOL. you are really making me wonder what your super dangerous method of cleaning hot smoking molten caramel out of the bottom of the oven is……. as hers) – i’ll have to give this one a test drive to see how it compares! thanks as always for sharing with us! Juli, I just used 1 teaspoon vanilla in the crust and that was fine. What we really tasted was the butter. It was a like a croissant in pie crust form. That is the tastiest looking apple pie I’ve ever seen!!! My husband will wash and peel apples all day if the result is apple pie!!!! I’m wondering if the 1 teaspoon vanilla substitution for the vanilla powder also covers the vanilla bean in the crust, or would you have to use 2 teaspoons? I don’t have vanilla beans! Oddly enough our “upscale” grocery store carries Danish butter. It’s fascinating to me the things that we can and can’t get here. I suppose it’s like that everywhere. You can get ancho and chipotle chili powders where you live, I have to get mine in another city or mail order. When I can get Dutch process cocoa it’s obscenely expensive and cheaper to just get it mail order. How silly is that!? No doubt there are other things. Looks fabulous. Generally I don’t bake pie, but this could change my mind, as you said. I did take a look at the ingredients and is must say — this is Paula Deen rich with all that butter. 🙂 But I’m sure that made a big difference. My husband loves apple pie and would be thrilled if I made this, especially considering we’re getting into apple season. Very interesting recipe, but I’m sticking with my version of my mother’s recipe, which has to be made with Macintosh or Jonathan apples (hard to find in Phoenix!) and a crumb crust. Wonder how this recipe would taste with Jonathan apples? Wow! Gorgeous! I will definitely be making this one soon, now that summer fruit is coming to an end and it’s time to start baking with apples again. I’m glad the pie turned out so wonderfully, Anna! Thank you for publishing the substitutions and how they worked — very good to know. who live in a house where there’s no cookie jar. Happy National Cookie Month, Anna. That pie looks gorgeous!!! Ooo wow that crust looks awesome! I’m not a big fruit pie person but will definitely have to try this out. I appreciate you sharing your substitutions and knowing that they worked. I usually use apple juice to replace apple cider and sometimes it’s from a juice box too.. it’s just the easiest! Sue, I’m not sure where I’d find Danish butter. I used my store brand’s “European style” and it was fine. Plugra would be good too. Meghan, the other recipe I’ve closed the book on is almond toffee/almond roca. oh wow! that crust looks fantastic! I will have to give this a try over the holidays! That pie looks incredible, and I don’t even really enjoy apple pie all that much! I’d be curious what other recipes you think you can “close the book” on! My husband and daughter love apple pie so I’ll keep this one in mind the next time I make it. The pie looks wonderful! I love Danish butter, but it’s soooo expensive. We splurged and got some when our daughter came home from Denmark and we wanted to make Danish pastries. The butter was worth every penny. It’s good to know that it’s worth it for this recipe too. I had this pie last night and it was fantastic, especially the crust. Wow!! Wish I’d had this recipe for our Apple Pie Contest at the Farmers Market last Sunday!! Looks Great! !